Another guy might have a sports car or a boat as his pride and joy. Jay Widmer of Corvallis, who has led the Linn-Benton Community College ceramics program for three decades, has a 40-foot long wood-fired anagama pottery kiln. 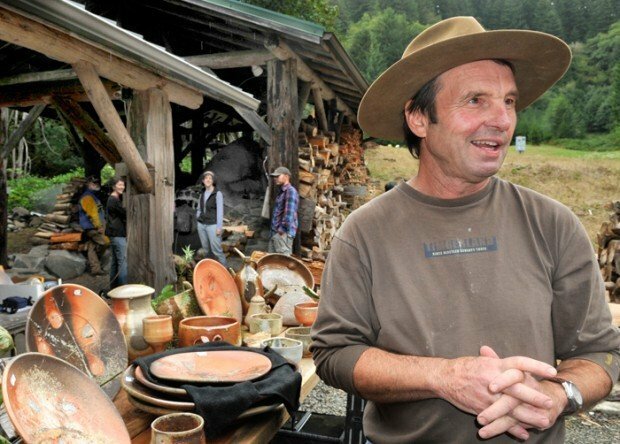 "From a potter's point of view, the ultimate is always wood-fired," Widmer said. The kiln is on Widmer's tree farm 12 miles west of Alsea. Twice a year for the last 17 years, artists from throughout the mid-Willamette Valley, and even from as far away as British Columbia, have flocked to the remote spot for marathon anagama firings. On Sunday afternoon, about 15 people were nearing the end of a 45-hour session that used four cords of wood from Widmer's acreage. 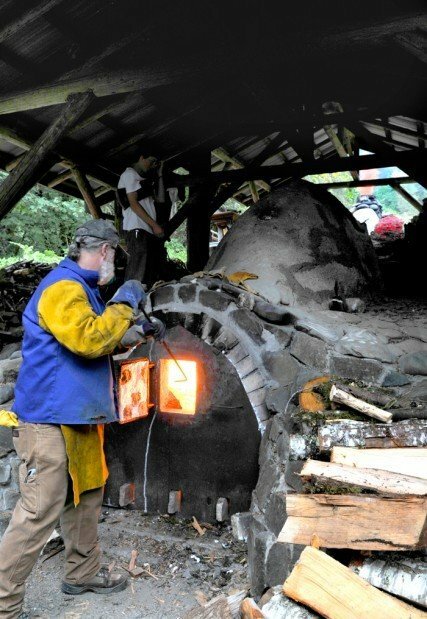 Ted Ernst of Corvallis, a chemist and LBCC pottery instructor, stoked the massive kiln, placing pieces of wood in the crackling and orange glow. Forty feet away, a flame taller than a man shot from the other end of the furnace, which contained about 350 pieces of pottery as well as a blaze of 2,300 degrees. The lengthy process creates so much heat that ash and minerals from the wood is deposited onto the pottery, giving it a unique shimmer or iridescence and color, Widmer said. "One side, the windward side, gets the ash buildup and will flow down the side of the pot. The back side is usually where the color is, from the flame wrapping around," he added. Widmer said he tries to direct the wood-fired anagama process, by selecting certain wood, for example, but that he can't control it. Ernst said that with the firings at Widmer's kiln, there's a bit of chance, luck or perhaps magic involved. "Every pot is totally different every time. Every pot is one of a kind. Think of it as the abstract art of ceramics. That kiln does a lot of the work itself," said Ernst, who had about 80 pots in the kiln. "It totally drives me nuts during the week, because I don't know what I'll get," he chuckled. The flames would be gone Sunday evening, but the kiln will remain hot for days. "Friday, we go in there and sweat and pull (the pottery) out. It will still be hot," Ernst said. The pottery firings usually are a private affair, but this weekend, the public was invited to watch the event as part of the Bounty of Benton County. The self-guided traveling tour of farms, wineries and other sites was a benefit for Strengthening Rural Families, and about 80 to 100 people made the trip to the county border. Patty Jackson of Corvallis said the journey was well worth it. "My daughter loves art. She's doing ceramics this year," Jackson said. "It was the biggest kiln I've ever seen," added Emily Jackson, who will be a sophomore at Corvallis High School. "I've seen the ones they have at school, but I didn't know they got that big."